Yachad Shabbatons are inclusive weekend retreats where Yachad Members join together with a peer group for an enjoyable weekend full of programs and socializing opportunities. Yachad Shabbatons are rich with enjoyable Shabbat meals, song and dance, educational programming, and many more engaging activities. 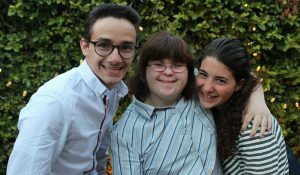 The inclusive nature of the Yachad Shabbaton allows Yachad members to interact with a peer group, whether it be a middle school, high school, a community, or a college campus, in an accessible environment. Each Yachad Member enjoys the Shabbaton with the guidance of an advisor, who facilitates the inclusion of each Yachad Member into each activity. The advisors work with each Yachad Member toward accomplishing individualized goals. The Yachad Shabbaton is a great environment for Yachad Members to meet new friends and increase social skills in a safe, fun and educational atmosphere. View our calendar for upcoming Shabbatons!